PHOENIX — John McCain sees one downside to having clinched the Republican presidential nomination: There's less attention focused on him than on the volatile contest between Democrats Hillary Rodham Clinton and Barack Obama. McCain understands he must compete for the spotlight. "I think it's going to be very exciting to watch," he said of the Democrats. "It makes me have to work harder, obviously, to make sure that we maintain the visibility," McCain told reporters last week. "It's also, when we think about it, a very long time from March to November. That's a long trip." McCain wrapped up the Republican nomination last Tuesday with victories in Ohio and Texas, but the Democratic primaries there put Clinton back into contention after 11 straight losses to Obama. Their contest, and the attention it commands, could last for months. McCain, in the meantime, must transition from smaller, state-by-state primary campaigns to a national campaign that in some ways is less suited to his style of campaigning. The Arizona senator thrives in the smaller settings of primary campaign events where he can make eye contact and talk directly with voters. That is how McCain staged his comeback two months ago in New Hampshire, where he held intimate, town hall-style meetings and held forth with journalists aboard his Straight Talk Express campaign bus. But a general election calls for massive rallies with crowds in the thousands, a setting that is Obama's forte but is less fitting for McCain, a slightly monotone speaker with a softer, somewhat raspy voice. McCain insists he will be able to continue his more personal style of campaigning, but he and his advisers are still working out how to do that. Another focus in the coming weeks: raising money to compete with either Obama or Clinton in the general election. "We can see the great job that our opponents have done in fundraising. We've got a lot of work to do," McCain said. That seems an understatement considering the staggering amounts raised by the Democrats. Last month alone, Obama raised $55 million, and Clinton $35 million. McCain, in contrast, was on track to raise $12 million, about the same as in January, according to his campaign. McCain's schedule has been packed with fundraisers — he held five in two days last week — and he will continue to raise money next week during a swing through the Midwest and the Northeast. As a thank-you to top fundraisers, McCain invited several to his ranch near Sedona, Ariz., for a barbecue Saturday. He has done the same for governors and senators who are friends and supporters, and for journalists covering his campaign. Another priority is finding a running mate. Once Texas and Ohio awarded him the delegates he needed for the nomination, attention turned to who that might be. 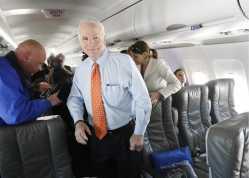 McCain campaigned Thursday with Florida Gov. Charlie Crist, one of many names being circulated as potential vice presidential candidates. McCain, 71, has said his foremost concern is finding someone capable of serving in his place. McCain said last week he wants to talk with people who have been involved with such a process before. Specifically, he mentioned A.B. Culvahouse, who served as counsel to President Reagan, as someone he wanted to speak with.